Download Fact Sheet 21: What happens at the end of a parliamentary term? The Western Cape Provincial Parliament (WCPP) is one of the nine provincial legislatures in South Africa. Based in Cape Town, the WCPP is constitutionally mandated to pass legislation, provide a forum for public debate, involve the public in the law-making process, and oversee the activities of the provincial executive. The WCPP consists of 42 Members, elected every five years on a proportional representation system. The Premier and members of the provincial Cabinet are appointed from these Members. This website contains information about the role and function of the WCPP, news, parliamentary activities including sitting and standing committee meetings, Members of the Provincial Parliament (MPP), legislation, publications, career opportunities, etc. Please feel free to browse the site. Should you be unable to find what you are looking for, please contact the Webmaster. Welcome and thank you for taking the time to visit our website. 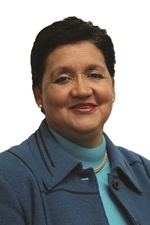 I am Sharna Fernandez, the elected Speaker of the 5th Parliament of the Western Cape.